"This Chapel is dedicated to S. Nicholas, who, on account of his pious childhood, was accounted the patron saint of children. The beautiful stone screen, which separates this Chapel from the Ambulatory, is attributed to William of Colchester, who was Abbot in the reign of Henry IV., and is interred in the Chapel of S. John Baptist. 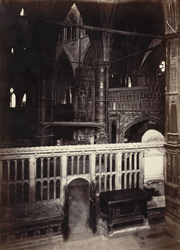 In front of the screen to the right, is an altar-tomb to Lady Cecil, who died in 1591; also, on the other side, the tomb of Philippa, Duchess of York, died 1431...Immediately in front is the Chapel of S. Edward the Confessor, where sleep the illustrious dead, and where thousands of pilgrims have knelt with profound reverence to offer up their fervent prayers before the altar of that shrine. To the right is a side view of Henry V.'s Chantry, the exquisite carving on which represents the coronation of that king."